Local governments are local leaders, policy makers, catalysts of change and the level of government best-placed to link the global goals with local communities. Learn how the SDGs can be applied to the daily work of local and regional governments and delivered collaboratively making communities healthier, more sustainable, liveable and inclusive places to live. 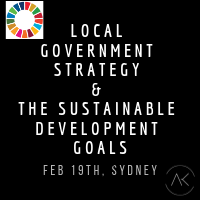 This workshop will elevate your Local Government Strategy through the lens of the Sustainable Development Goals (SDGs), and help you to bring your stakeholders on the journey. Understand each goal, its indicators and how Australia is performing. Be inspired by Guest Speaker in a ‘live podcast’ with UNAA SDG National Program Manager – Patricia Garcia, AO. You will also receive unique SDG mapping and strategy builder tools as part of the workshop.